Over 45 Years in business Check out our extensive selection of cargo trailers! We build custom boat trailers to fit your boat in painted steel, galvanized or aluminum. Here at Magnum Trailers, our goal is complete customer satisfaction as it has been for the last 45 years. We will do whatever we can to get you the best deal on your next trailer, whether it be new or used. We stock a variety of different brands to suit your needs including PJ Trailers, Top Hat, Performance Trailers, Wells Cargo Trailers and Continental Cargo Trailers and of course our Magnum line of trailers. Magnum has been building high quilty trailers for over 40 years. You can see our current inventory on this website and if you don't find what you're looking for, give us a call or stop by our office and we'll get it for you. We guarantee the best prices on our new trailers to ensure you get the best trailer for your money. On any brand we carry we are confident that we can meet or beat any deal you can find plus we offer service and convenience to our customers. We have four locations in Texas to better serve our customers. You can find us in Austin, San Antonio, Georgetown and San Marcos. For maps and directions, visit our Contact Us page. Looking to finance your next new trailer? 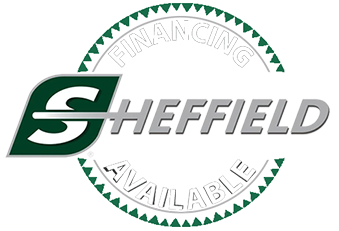 Look no further, here at Magnum Trailers we offer Sheffield financing for our PJ Trailers, Top Hat, Performance Trailers, Wells Cargo Trailers and Continental Cargo Trailers. Stop by or call us for more information.